As the most popular choice in the market, pressure-treated softwood timber is widely available from your local DIY stores & is hugely affordable for those looking to limit the budget of their build. It’s often the least costly timber you can use for your structure, however what you don’t spend now you may need to spend further down the line on maintenance costs. Before you buy, read our expert facts & opinions so you know exactly what you are buying into. Choosing the right type of boards to match your needs is so important. – How does pressure-treatment work? Looking for a cheap yet high-quality decking supplier? See below to get the cheapest price on your softwood decking today. Pressure-treated decking is usually made from Pine, though other softwoods such as Cedar are sometimes used. The treatment process the timber goes through helps to protect it against rot, fungus and bugs which would otherwise bore into the surface. Softwood decking is commonly sold as ‘redwood’ or ‘whitewood’. It is stainable, very tough & has the traditional, natural feel which many people have come to expect from their decking boards. It is also incredibly versatile & easy to work with – all characteristics which have made it one of the most popular choices for new decking builds. However it does have its downsides – softwood timbers have a reputation for cracking, splitting & warping easily, especially in extreme or variable conditions. This means that maintenance time & costs can often be high. Top Tip: Some retailers produce a pressure-treated product that is then Kiln-Dried After Treatment (KDAT). This drying out process helps to reduce any warping & shrinkage after fitting. Often this will be packaged-up as their ‘Premium’ product, costing anything up to 50% more than the economy boards. Despite the additional cost, we’d highly recommend shelling out extra for the hassle it will save in the long-term. Softwood or hardwood - what's the difference? Timber is often classified as being either softwood or hardwood. Surprisingly, these terms do not describe the relative hardness of the wood but the type of tree from which the wood has been grown. Softwood is cut from coniferous trees which are usually very fast growing. Generally, trees that keep their leaves & foliage all year round tend to be classed as softwoods; trees such as Pine & Spruce. Because they grow quickly, they are more economical & can be re-grown quicker than hardwood alternatives. Most people choose this type of decking because it is cheaper & easier to work with than hardwoods or composites. It can also be stained to look just like a hardwood. In the same way that hardwood isn’t necessarily hard – softwood isn’t necessarily soft. It can be just as strong & durable; these decks have been known to last up to 35 years if treated & maintained with care. Treated softwood is usually a pale green/brown colour – but will often turn into a honey brown colour after being weathered outside for a month or two. Different species of wood are often chosen not for their ‘hardness’, but for their ability to resist rot & decay. Some types of wood have a natural propensity to resist the conditions which lead to decay. Timber will normally begin to decay when its moisture content is consistently above 22% and as such, grades which naturally reject this threshold usually last longer in outdoor conditions. See our guide on hardwood decking for more information on the big differences between the two types of wood. So how does pressure-treatment work? First, the timber is loaded into the cylindrical treatment vessel called a Retort, where it is placed into a vacuum. All air is completely removed from the wood. Whilst still under vacuum, the treatment vessel is then flooded with the manufacturers choice of waterborne chemicals (likely ACQ or Copper Azole). Next, hydraulic pressure is applied to the treatment vessel, forcing the mix of preservatives deep into the timber which has been evacuated of air. Any excess preservatives are drained through a final vacuum, while any excess preservatives are drained back into storage. After the low pressure has forced the preservatives deep into the timber, the vacuum is removed & it is re-exposed to a normal atmosphere. Finally, the timber is left to dry naturally. Did you know? A study by a leading US producer of wood preservatives, Lonza, claimed that 75% of decking structures use pressure-treated wooden decking for their surface finish. Unsurprisingly, this makes this type of decking far-and-away the most popular choice for consumers. This is very cheap decking compared with other alternatives – so finding a good deal shouldn’t be too difficult. You can either visit a supplier in-store or buy your boards online. Provided you know the quantity you’re looking for – either option works fine, but remember you will nearly always find the better deal online. It can sometimes be very difficult to know exactly which supplier offers the best deal, because deck boards are all different sizes & quality. Many sites don’t make it easy to compare. Thankfully our experts have collected their top suppliers list below, with prices broken down per square metre – so you can see clearly which are truly offering the best deal. Remember to also use our handy decking calculator – which will help you understand the quantity of materials you’ll need for your build. We've chosen B&Q as our top buy for softwood decking boards - not because they’re the cheapest, but because they offer excellent quality & a product range to suit any need. In terms of value for money, they are the best buy on the internet. Customers can also benefit from next day delivery depending on the size of their order. Some customers on Trust Pilot have reported issues with B&Q's customer service, so do be wary of this before buying. One of the enduring appeals of pressure-treated softwood is its flexibility & it is incredibly easy to work with. The ease with which it can be cut & fastened with nails makes it a DIY & trade favourite. However it’s also important to remember during your build that this type of decking is incredibly susceptible to warping, shrinking & splitting. Always use the utmost care when cutting or fitting the timber. Remember: when working with timber, you should always wear gloves to protect the skin on your hands against splinters & abrasions. This is especially important with this type of wood. Galvanised nails should be used with copper-treated wood to prevent corrosion & rust (which you’re likely to incur with the use of iron or steel nails). The greater the exposure to corrosives, the thicker the layer of Zinc required for the nails/fasteners. ‘Cupping’ is the process by which aged pressure-treated boards tend to bend across their width as they dry-out. This causes them to curve – either upwards or downwards. If they curve upwards (bad news) they can collect rainwater & often need to be sanded down. If they bend downwards then rainwater will drain from them naturally. By observing the small amount of cupping which has likely already taken place with your boards, you can usually ascertain which way up each board should point. By installing each of your boards so that the peak of the cup is facing upwards, it will often flatten out as it dries. This helps to reduce the likelihood of the decking boards splitting when fastening. Manually screwing the nails will often cause problems without predrilling – as the wood dries it will often crack & split, causing problems. After installation, pressure-treated decking will always shrink over time. By leaving little to no space between boards, you allow for the gaps to appear naturally. If you don’t allow for this shrinkage, you risk gaps between boards of over 2cm – far too wide for a practical structure. Although the pressure treatment of the wood helps to prevent bug infestations & rot, it does not inhibit weathering. This means that pressure-treated wood experiences the effects of outdoor elements in much the same way as ordinary wood. It’s therefore very important that you apply stain or wood preservative to your wood in the build of your new structure – and in the years of aftercare which will follow. Applying a preservative will slow drying & therefore prevent the shrinkage & splitting which often occurs when this type of wood dries too quickly. Always make sure that the preservative you buy is recommended for use with pressure-treated timber. You can (and should) apply preservative immediately to your new structure, but you must remember to apply a product which has been specially designed for use with fresh pressure-treated timber. One of the great things about softwood is its versatility; and unlike other types of timber it can be stained or painted with ease. Staining can be carried out immediately during the application of preservative to your decking boards. However if you’d like to paint your structure, you’ll need to wait a little longer. The moisture in freshly treated boards can lead to poor paint adhesion, so it’s important that you let newly-treated boards dry out somewhat before painting. If you’ve recently applied preservative, it’s also recommended that you allow this to form a ‘seal’ before painting over the top of it. Waiting one month after the application of your preservative will normally allow enough time. Most preservatives offer recommended timelines in their instructions – just check the back of the tin! 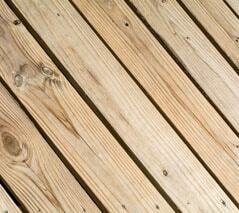 Pressure-treated softwood decking should be power-washed at least once a year. To care for the surface, it’s also recommended that you clean, sand & re-seal the deck once every 2-3 years. Not only will this process revitalise the appearance your deck, but it will dramatically increase its life-span. Softwood decks usually last a minimum of 10 years, but have been known to last 25 years or more with the right care & attention. Pressure-treated softwoods have a mixed history with vast deforestation & environmental pollutants. The chemicals used in the pressure-treatment are also known to be toxic chemicals which can be harmful to the environment. However, the chemicals used have improved since new legislation in the early 2000’s. Historically (for more than 60 years) pressure-treated timber was infused with Chromated Copper Arsenate (CCA) which is now known to be a toxic chemical & carcinogen. However, new regulations have been introduced and CCA hasn’t been permitted for use in pressure-treated timber for over 10 years now. Nowadays, manufacturers use safer chemicals (mostly ACQ or Copper Azole) which are known to be much less toxic to humans & the environment. Given its popularity & ‘throw-away’ nature (it’s just so cheap!) this type of timber is known to be a big contributor to deforestation. However softwood often comes from sustainable sources where huge numbers of these coniferous trees are mass farmed, almost like crops. With these sustainable producers, every tree which is cut down is replaced by another one planted. You should always look for the FSC logo on any decking boards you buy, to ensure that the timber has been sourced from sustainable forests.